We either have them or know someone who has them. Every year, someone wears the ugly Christmas sweater. But, today’s the day to wear them. It’s National Ugly Christmas Sweater Day. Yes, that’s right! The crazy-looking top actually has its own day. During the holiday season, it’s time to celebrate the popular time-honored tradition. 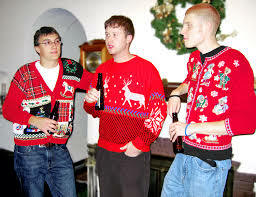 Many people have started having parties dedicated to the ugly Christmas sweater. There are tons of ideas that you can use to create your own. Some people choose the Christmas present by covering their sweater with wrapping paper and covering it with bows. Others make themselves look like a Christmas tree by covering themselves with lights (fake or real) and tinsel that they glued together. But, have you ever thought about where the tradition came from? Think back to the movie “National Lampoon’s Christmas Vacation” as well as the tops that people have worn on television ever since then. People made wearing them a trend. Yes, much in the same way that people have worn tie-dye shirts, mini skirts and other fashions from the past, ugly Christmas sweaters have become so popular that many people wear them every year. What’s your favorite sweater design? The Powell Group invites you to get creative during the holidays. You can easily find the makings for your own ugly Christmas sweater. You can either buy them in a clothing store or add to a sweater you already have by getting your own trinkets in your favorite crafts store. Either way, you can have a great party in your own home. If you are moving within the Western Upstate of South Carolina, log on to our website and have a look at all of our beautiful homes. We are sure you will find exactly what you are looking for.